While investigating a myterious double murder, Patrick Bowers is drawn into a high-tech conspiracy that has roots going back to the Cold War. Steven James’ fifth installment in his award-winning Patrick Bowers Files easily proves that he has not lost his ability to create heartpounding thrillers that are easy to get caught up in and not wanting to close the book. Steven adds multiple new characters to this novel to give it a fresh feel. All of these characters– such as Patrick’s brother Sean and his wife Amber– are enjoyable, but there is one that kept me looking forward to getting to a chapter where he made an appearance: Alexei Checov. Alexei is an assassin who is quite different than any other character we have met in the series. His methods are chilling, yet he has a certain degree of likeableness. Needless to say he has made his way to one of my favorite characters in the series. The plot is quick paced and much different than any of the past four books. Patrick has to take on a mysterious crime that not only isn’t what he is used to, but he also has to solve the large web of mysteries without much help from his high-tech devices that he was able to do use in the past. Also, with the climax of the novel being set up throughout the whole book, there is very little dull moments. 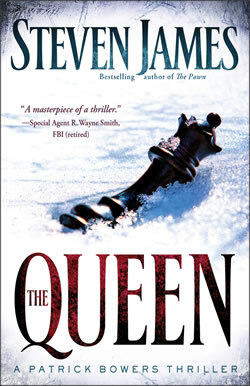 With these fresh elements, The Queen has proved to be another great novel by Steven James.